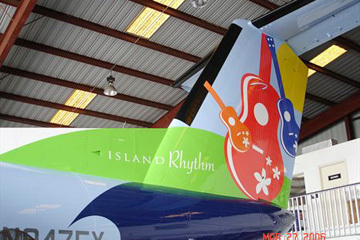 Island Air has received a newly repainted Dash 8 aircraft, the first to display an ukulele tail design, one of the airline's three design variations. Over the next two years, Island Air's fleet of 11 Dash 8 aircraft will be repainted to represent classic Hawaii themes. "Island Rhythm" is a tribute to the ukulele, "Island Beauty" features a graceful hula dancer and "Island Style" features surfboards. Island Air's aircraft interiors are also being transformed, with a new color scheme including dark- and light-blue leather seating. Island Air currently offers 92 daily flights between the islands of Oahu, Maui (Kahului and Kapalua), Molokai, Lanai, Kauai and the Big Island (Hilo and Kona). For reservations and flight information, visit islandair.com. The Ritz-Carlton, Kapalua, offers tips for making Mom feel special. » Reserve the sumptuous Mother's Day Brunch Buffet. Executive chef John Zaner has created an elaborate buffet menu for the Terrace Restaurant, served from 11 a.m. to 4 p.m. for $75 per adult, $37.50 per child. A variety of fresh salads, cheeses and fruit as well as omelets, seafood and carving stations will be presented. » Indulge her with a special spa experience. Select the Hawaiian Healing Experience, where she can choose one of seven common life issues to address during the treatment. (Harmony or family relations, anyone?) The Wahine's Choice package includes a half-day of pampering with body polish, signature massage, signature facial, and shampoo and styling in the salon. » Indulge with a Butler Drawn Bath. Available in the evenings, a luxurious bath menu offers a wonderful way for Mom to relax and allow her worldly cares to melt away in the privacy of the guest room. To create a Mother's Day weekend getaway, call toll-free 800-262-8440, call the hotel directly at 808-669-6200 or check online at www.ritzcarlton.com.